YES! 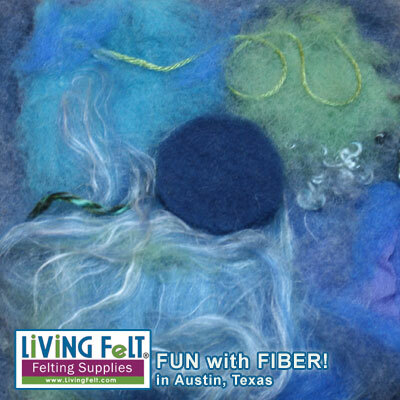 Living Felt offers felting workshops right here in Austin, TX! 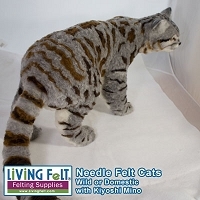 Past and present classes include needle felting animals and birds, felting pictures, nuno felting a scarf or shawl, wet felting over a resist to make felted slippers, cat caves, purses, etc.! We have also included classes for silk dying and eco-printing. 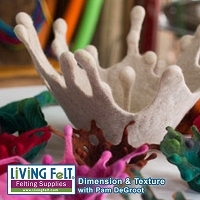 Taking a felting workshop is great fun for hands-on learning. 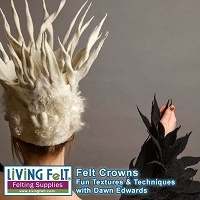 See our list of felting workshops below and call us with any questions at all! Look for our easy 50% deposit and our "lay-a-way" program for multi-day classes! 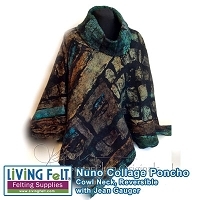 We do our best to include the materials fee whenever possible! Also, read below on the LF BFF Travel Buddy program to find a roomie and save on hotels and car rental. Tuition is payable at the time of registration. For some workshops, a 50% deposit is available with the balance due at the conclusion of the workshop along with any materials fees. Lay-A-Way: If a lay-a-way payment plan is offered for a particular workshop, the payment increments are pre-defined based on the total workshop cost and will generally divide the total cost into 4 or 5 payments. You may make more than one payment at a time if desired. Payment #2 is due 30-days later. Payment #3 is due 30-days after the 2nd payment. If paying by credit card, we will contact you after your first payment to get your CC#, and payments #2 and #3 will be charged automatically. If paying with PayPal, we will send you an email to make your 2nd and 3rd payments within 36-hours of receiving the email. If any payment is not made within 36-hours, you may lose your space. Lay-a-way is only available when the class is at least 120 days out. If you opt for the lay-a-way plan, you are agreeing to the above payment schedule and terms. You may pay by phone or online on the same page you registered for the workshop. In your order comments, it may be helpful to put #2, #3, #4, etc as payments are made so you have that in your notes. 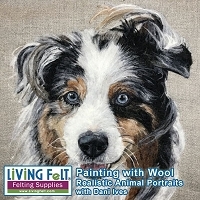 Final payment is due at the conclusion of the workshop, along with any materials fees. Please see our Refund policy below. Fees vary by class. Materials fees are additional and cover the cost of supplies provided by shop/instructor and used by individuals for their in-class projects. 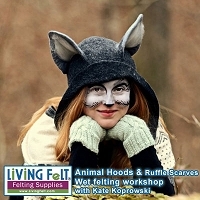 Students may also be asked to bring tools and materials of their own to the workshops. 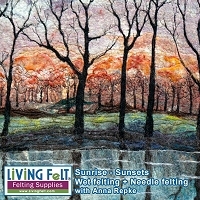 Materials Fees to the shop or instructor are due at the conclusion of the workshop. Due to financial commitments of bringing teachers from out of town and out of the country, registered students desiring to withdraw from a class with an out of town instructor must do so no later than 60-days before the first class to receive a refund less 10%. For classes by in-house instructors, withdrawal no later than 30-days is required for refund. If you withdraw past the refund date, and a class is full, we will try to help fill your seat from the wait list. If we are able to fill your seat, a full refund will be granted. There are no make-ups, refunds or credits for missing a regularly scheduled workshops. If a class is full, it will say "on back order". In that event, please email or call us to be placed on a waiting list. When an opening comes available, you will be notified and will have 24 hours to respond. After that time, the seat will be offered to the next person on the list. If a class is canceled, you will be notified approximately 2-4 weeks before class begins or sooner whenever possible, and tuition will be refunded. When possible, classes not held due to bad weather or instructor absence will be rescheduled. We order lunch for the entire group from local restaurants. Please bring cash for lunches. Average spend is $5-$10 per person, depending on what you order. You may bring your own lunch and snacks to workshops if desired. We also have healthy restaurants and a major grocery store nearby and can order lunch! We provide coffee, tea, water, sparking water and light snacks to all of our guests. otherwise, it tends to give a wrong location. Students needing overnight accommodations may enjoy a variety of offerings in the area from B&Bs, to very Austin funky hotels and chain hotels from budget to elegant. **If flying in a day early and/or leaving a day later, can be beneficial to stay near the airport for the first/last nights and take advantage of free shuttles -- plus save on car rentals. 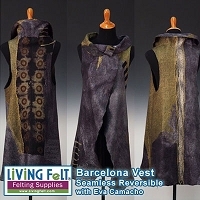 **Reserve by phone and tell them you are with LIVING FELT. If at least 4 rooms are booked, they will give you a discounted rate thru Thursday night. A lot of weddings are held here in the hill country, so BOOK EARLY. To be closer to Austin, or more of a budget rate, stay closer to I-35 and near I-71 or near the airport.